Cătălina Antal in Me: A Dollhouse. Photo by Adi Bulboaca. BOTTOM LINE: Romanian artists remix Henrik Ibsen's A Doll's House to present Nora's side of the story and explore the consequences of her choices through expert visuals, film noir stylings, and heartbreaking music. When Henrik Ibsen first conceived of A Doll’s House, he wrote in a letter that "a woman cannot be herself in…an exclusively male modern society, with laws made by men and with prosecutors and judges who assess feminine conduct from a masculine standpoint." In Me: A Dollhouse, Ibsen’s protagonist is finally, fully herself, and finds that she may not like what she sees. Me: A Dollhouse is part of the Future is Feminine series at HERE, presented by the Romanian Cultural Institute and a team of Romanian institutions to present new work by Romanian female artists that re-imagine the plays of Henrik Ibsen. This series, including another play running in rep (Ibsen Incorporated), along with several Q & As and cultural events, presents a vision of Ibsen’s deeply complex female characters in light of contemporary challenges faced by women. In Ibsen’s original play A Doll’s House, Nora and Torvald lead a peaceful, middle-class life following a period of hardship after Torvald became ill and the couple was required to relocate to Italy, an expensive move. Unbeknownst to Torvald, his wife Nora borrowed money by forging her father’s signature on a bank loan to pay for Torvald’s medical needs. Torvald infantilizes Nora, calling her a “doll” and a “child” and admiring her innocent, naive qualities. After a disgruntled employee threatens to expose the fraud through a letter, Nora’s marriage is strained and she discovers her husband is not a paragon of strength and noble character as she thought. Declaring that she has been treated like a doll her entire life, from her father’s house to her husband’s, Nora realizes the need to discover herself and leaves her husband and children. In Nora’s view, she sacrifices her integrity and livelihood to save Torvald’s life, secretly repaying the debt on her own as the decision hangs over her family’s head. Torvald instead diminishes her at every turn, rendering her small and weak, unable to self-actualize until the collapse of their marriage. As she becomes determined to find herself, her resolve grows as she narrates possible futures and hits the open road. Extending beyond Ibsen’s original story, Nora attempts to discover herself and ultimately finds that she is incredibly lonely and lost. Frustrated and bereft of “wanting to work and having no one to work for,” she gives in to her despair and collapses, ceasing to exist without purpose in her life. The reduced, remixed narrative cuts all the secondary characters and focuses entirely on Nora’s remembrance of events. The only other character onstage, “the singer” (Cătălina Antal) interjects between moments of the narrative in near-wordless arias, singing Nora’s emotional affect as Nora herself refuses to engage on an emotional level. 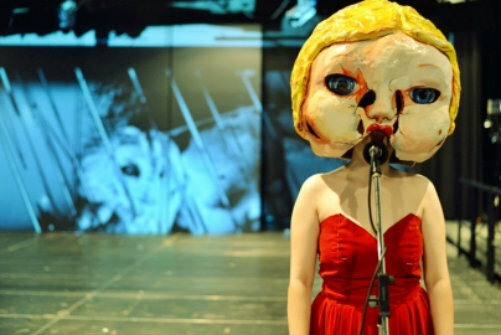 The singer also stands in for Nora’s former doll-life, represented with an oversized papier-mâché head reminiscent of Betty Boop and staring off, lifeless, as she pours out her emotions. Ovidiu Chihaia’s music is engaging and disconcerting, sounding vaguely like 90s-era prog rock with an inexplicably classical twist, that serves to heighten the odd evil world the production creates. We also occasionally hear from Torvald, in the form of direct quotes from Ibsen’s original script. This is not, however, Ibsen’s blustering patriarch, but a sinister and cruel disembodied voice represented by collages of insects, frightened women, and classic horror film. Visually, Me: A Dollhouse is rich and unique, and Cristina Baciu’s dynamic video is expertly crafted. Through the visuals, Nora experiences her marriage’s end as a violent thunderstorm, and her character’s shifting natural collage evoking images of owls, flowers, and trees becomes lonely and barren as the story progresses. Baciu also draws from classical sculpture, finding stone faces with extreme emotions to contrast Nora’s static recounting. Overall, the play’s darker take on Nora’s character provides a new perspective, and is an engaging approach offered by a talented production team. Me: A Dollhouse is by Carmen Lidia Vidu, based on a script by Henrik Ibsen. Directed by Carmen Lidia Vidu. Set Design is by Constantin Ciubotaru. Music composed and recorded by Ovidiu Chihaia. Video is by Cristina Baciu. Mask design is by Cristina Mihaela Rădulescu. The cast is Aura Călărașu and Cătălina Antal.